Do You Know Your ABC’s…? A. Advertising that one has been “in practice for ten years,” when in fact the person has been licensed for two years but has included the time period that he or she was in an educational program or gaining hours of experience toward licensure, may be viewed by some, including a licensing board, as misleading. Therapists and counselors must always be aware of the representations they make to others (the public) in writing. B. Barter – professional association ethical standards differ on how they address the issue of barter, so be sure to read the ethical standards that apply to you (and any applicable law or regulation) and be sure that you are aware of the possible “danger zones.” One such danger zone may be entered when the patient or client performs personal services for the practitioner in exchange for the counseling or therapy performed by the practitioner. C. Confidentiality – is the cornerstone of psychotherapy and counseling, but the exceptions are many. One of the most important exceptions to confidentiality in California and other states, and under the HIPAA regulations (which patterned much of their provisions on California law), is that a signed authorization is not needed when a health care provider communicates with another health care provider for purposes of diagnosis or treatment of the patient. D. Defending yourself in a criminal case (e.g., drunk driving, unlawful possession of drugs, petty theft) or in a malpractice lawsuit or a licensing board action, is your right – and it should be protected by hiring competent counsel to represent you. In criminal cases, avoiding the conviction of a crime, if feasible, is critical, since licensing boards can often use the conviction as evidence against you in a disciplinary proceeding based solely on the conviction. Pleading “no contest” is generally considered to be a conviction. E. Evidence in a lawsuit consisting of a therapist or counselor’s testimony or the production of the treatment records of the patient may be sought in a variety of circumstances. Unless the practitioner is notified in advance, the first indication that such evidence will be sought may be in the form of a subpoena. The first thought that the practitioner should generally have upon receipt of the subpoena, is to protect the “psychotherapist-patient privilege. The practitioner’s testimony or records should generally be protected from disclosure and discovery in the lawsuit (unless the privilege is waived by the patient or by operation of law). F. Fees – sliding fee scale? Do you “slide up” from your usual and customary fee when there is an insurer who will be paying for your services? Such action can be viewed or argued as insurance fraud. I have often said that if one has a sliding fee scale, they should slide down from their usual and customary fee. G. Guardians generally have the same right to access patient records as does the adult patient. While it may not occur too often, therapists and counselors must sometimes be familiar with the particular requirements that would allow the practitioner to deny access to the guardian or to prepare a summary in lieu of the actual record, such as when the patient does not want the guardian to see the actual records. H. Health care records must be kept and maintained as specified in state law or regulation. Some states are specific as to how long records must be kept, while others may allow for some flexibility, or provide no specific time requirement. What if a former patient asked the practitioner to destroy his records in order to protect his privacy because of the nature of the embarrassing and personal disclosures made and recorded? Suppose that the request occurs three years after treatment ends and the patient is willing to sign a statement that indicates that this destruction was done at his request and that he has been informed of the possible consequences regarding future health care and the lack of prior treatment records. Can the patient/consumer be accommodated in your state? I. Immunity from liability is granted by state law for specific purposes. Each state may have a variety of laws that provide immunity for therapists or counselors in dangerous patient situations, in child abuse reporting situations, and under elder/dependent adult abuse reporting laws. Also, some states may provide immunity from liability for those practitioners who serve on ethics committees or peer review committees under some circumstances and with certain limitations. J. Joint legal custody – who can authorize treatment of a child? Either parent? Both parents? Does the court order specify that the consent of both is required in order to treat, or does it specify that the parents must consult with one another before obtaining healthcare for the child? Is there a law in your state that requires the practitioner to have the written consent of both? These are some of the questions that must be asked. There are times, in many states, where the consent of only one of the joint custodians is necessary or appropriate. L. License renewal – a yawner? Not for some! Do not allow your license to lapse as a result of negligence or oversight. There is no excuse – usually! There can be unintended and negative consequences for someone who treats a consumer while not possessing an active license. M. Malpractice in the form of negligence can lead to civil liability. But, does it give a licensing board the authority to take action against you? Generally, “no,” but state laws and regulations must be checked in each instance. Generally, only gross negligence, repeated or multiple acts of negligence, or intentional misconduct is actionable by licensing boards. N. Never allow your malpractice/liability insurance to lapse. Just when you least expect it, a problem may arise. As with your license, the expiration date must be calendared appropriately. Do not rely upon notice from the licensing board or from an insurer. I have spoken with therapists who have said that they did not get a renewal notice. Sometimes, they neglect to tell me that they have recently moved and that they did not notify the insurer or others. O. OCR (Office for Civil Rights) – just in case you ever receive an unexpected letter from the OCR, which is part of the U.S. Department of Health and Human Services, they are the enforcement arm for HIPAA violations. If you are not a “covered entity” under HIPAA regulations, the OCR has no jurisdiction to take action against you for an alleged violation. P. Privilege and confidentiality are not the same things. Can you articulate the differences between the two legal concepts and explain them to patients? Simply stated, and as a start to the explanation, confidentiality is a restriction on the sharing or volunteering of information outside of the courtroom setting, while privilege involves the right to withhold testimony or records in a legal proceeding. Q. 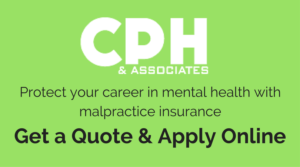 Quickly (immediately) send your malpractice carrier copies of any demands, notices, summonses, or legal papers that you receive in connection with a claim or suit that may have been filed against you. You must also promptly notify the malpractice carrier when a claim is made or a suit is brought against you (the insured). R. Rely on your instincts when you think about declining to commence treatment with a patient. Sometimes, the best decision you can make is to decline to see a patient or client that your instincts tell you may be trouble. T. Terminating therapy or counseling – I have often suggested that the first instinct of a therapist to write a termination letter (with no prior notice to the patient) should be given more thought. Once you write the letter, you are stuck with the words – so the letter better be very carefully drafted if one is to be sent. Sometimes, and depending upon the circumstances, it might be better to do the termination in person or after a phone conversation. Thereafter, the letter can be sent confirming what was said in the personal or telephonic interaction. U. Understand that documentation of your records is especially important when you make important decisions like changing the nature or course of therapy, or when making a decision regarding the patient’s dangerousness and the actions that you have decided to take. V. Victims of violent crimes may be entitled to compensation through a state entity that provides funds, often derived from court-assessed penalties for those convicted of certain crimes, to cover out-of-pocket expenses for medical care, including payments for psychotherapy provided by specified providers. W. Waiver of the psychotherapist-patient privilege generally occurs as a matter of law when the patient shares the otherwise confidential information with a third party (e.g., telling a friend about communications between the patient and the therapist) or when the patient tenders (or puts into issue) his or her mental condition in a lawsuit (e.g., claims emotional or psychological harm as a result of the defendant’s negligent conduct). Depending upon the particulars of state law, the practitioner generally will assert the privilege on behalf of the patient until the patient and the patient’s attorney make clear that the privilege is being waived- whether as a matter of law or otherwise. X. Ex – patient… is there such a thing? Is there a duty to see someone in therapy or counseling whom you have seen before? Do you owe any duty to someone after a proper termination has occurred? Do you agree with the saying – “once a patient always a patient?” When you stop seeing your physician after the broken bone is repaired, is there a termination of the doctor-patient relationship? Do you typically receive a termination letter following a course of medical treatment? Y. Youthful patients are also entitled to confidentiality, at least to a certain extent – depending upon applicable state law. In California, for example, minors who are twelve or over (with limited exception) have the same expectation of confidentiality as do adults. Parental rights to inspect or copy records are rather limited, and the law favors good faith denials of access by parents. Z. Zero tolerance – for sexual relations or sexual contact with patients. As I have said to workshop attendees, you can have sexual relations with anyone in the world except minors and patients – isn’t that enough?